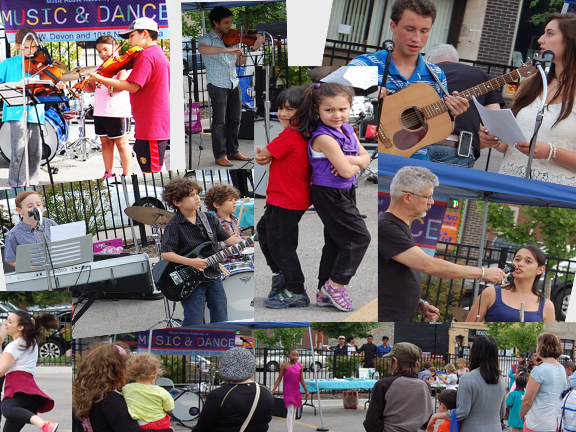 Yesterday’s Devon Community Market hit a grand slam — an eclectic assortment of vendors, delicious food, enthusiastic crowds, and a sensational show from the young performers at Music House Academy of Music & Dance. It was exactly the way to spend a few relaxing hours on a near-perfect mid-summer day. Young families enjoying the food and fun. The talent of the students and instructors from Music House was breathtaking. Every genre of music was represented, from classical to rock. The dancers were superb. The violin ensemble, accompanied by Richard Trumbo, Music House Director, on guitar, entranced with lovely, lilting melodies. Dalia Chin delivered an outstanding performance, playing “The Dance of the Blessed Spirits” from Gluck’s opera “Orpheus.” In a brief interview with Trumbo afterwards, Dalia announced that she is now a Certified Suzuki Flute Instructor qualified to teach children as young as three years of age to play the flute. Imagine! The Ravens, a trio of second-graders, had the crowd rocking and cheering. They covered several numbers that were big hits in the 1980s–their grandparents probably had the original recordings on eight-track tapes. Madyson Lockett, a talented singer and tap dancer, stopped pedestrians in their tracks–she’s a star in the making. The sheer joy of performing came through in every step taken by the youngest performers, who thrilled the crowd with their modern dance number. Dance Instructor Rachel Molinaro moved fluidly through a graceful improvisational dance, with music provided by Dalia Chin. Music House closed its show with Nate Jakaitis on guitar harmonizing with Kimberlyn Gadawski’s lovely vocals. The crowd was sorry to see the show end. 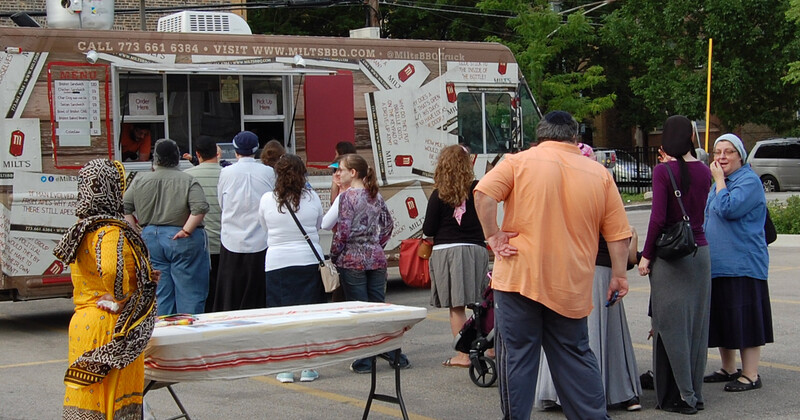 Milt’s Kosher BBQ truck made its first appearance at this year’s Market. 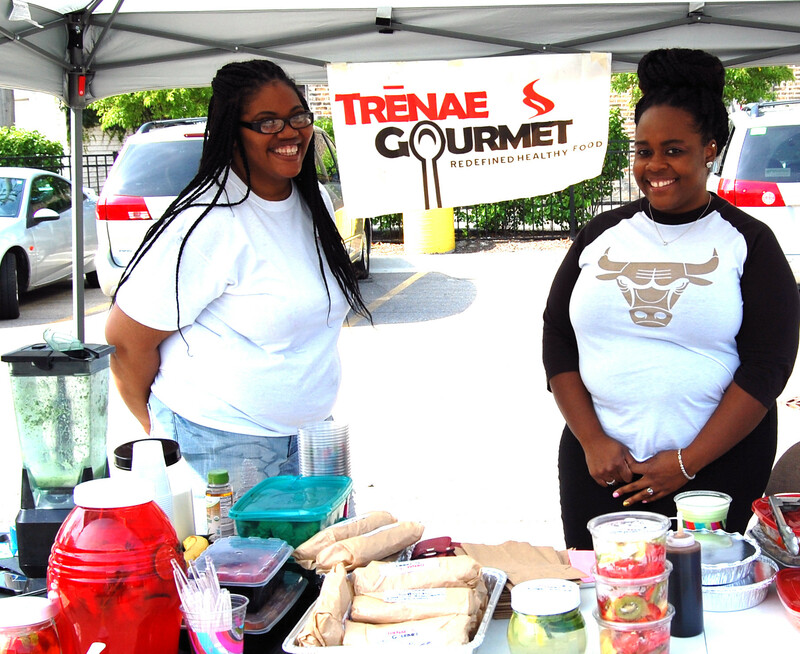 There were long lines for the sandwiches, brisket, and cole slaw and everything sold out quickly. But they’ll be back. A long line for Milt’s Kosher BBQ. brown rice bowls with chicken. I bought a turkey wrap and Mango Tango for dinner, and both were delicious. 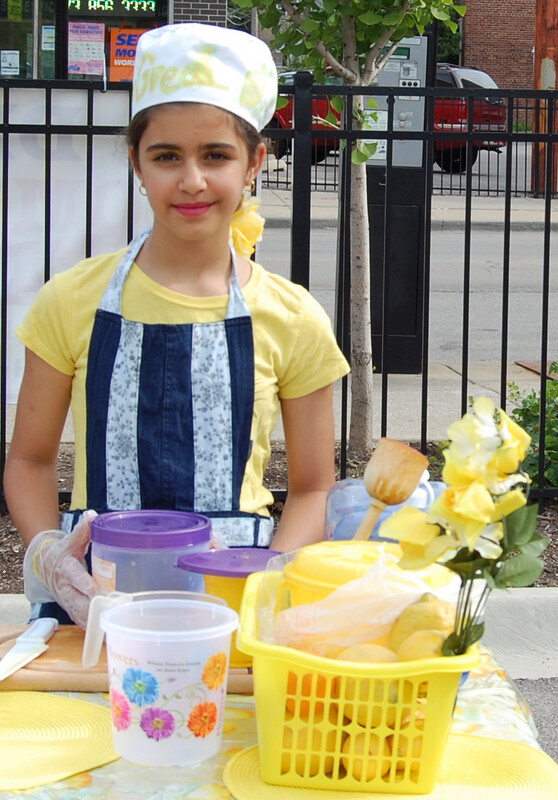 Returning to the Market this year is MarGREAT’s Lemonade, the specialty of an 11-year-old entrepreneur who is saving her profits for her college education. MarGREAT’s Lemonade is perfect for a hot summer day. I had a glass of it myself, and it’s light and refreshing. Made with real lemons, not bottled juice, each serving is made to order. The afternoon turned warm, so MarGREAT’s Lemonade was just right. It’s really good. MarGREAT is a clever play on her name, Margaret. Also new this year was InsideOut Health (Shaklee Products), offering various personal and health care products as well as eco-friendly cleaning supplies. and Bluetooth devices. 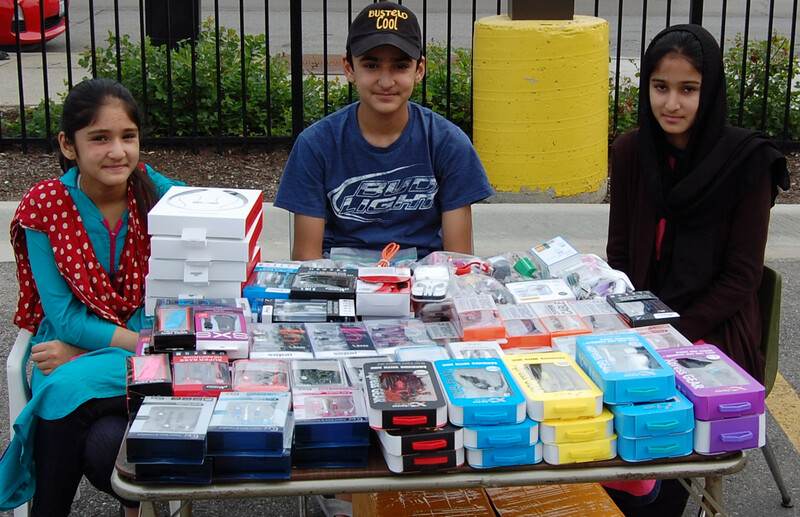 The three enthusiastic young vendors (Tooba, Abdullah, and Noor) really knew their business (the family has a store on Devon). everywhere. 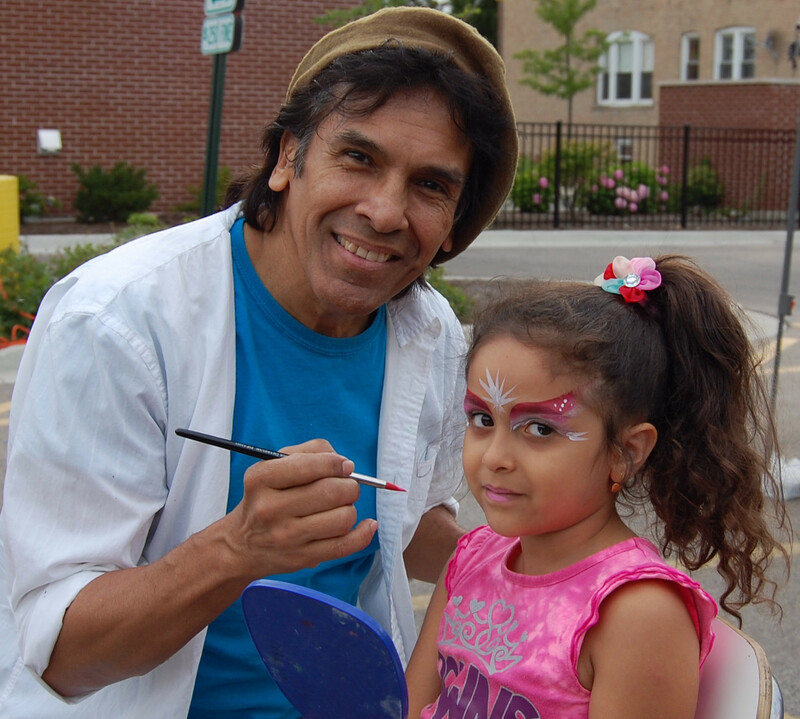 Marej Sultana continued to amaze with her beautiful henna designs, and Shmooz the Clown amused the kids with his bright red nose and curly blue hair. Joan Olson. our local Avon Lady, returned with a variety of products including a roll-on soap product for kids, jewelry, and handbags as well as perfume and cosmetics. Joan’s a rotating vendor, so check the schedule to see when she’s there. Stop by for the mosquito-repelling Skin So Soft bath oil and pick up a catalog, too. Fehr Bros. Farms returned for its second week. I bought some of the ground beef patties (95% lean), and enjoyed one for lunch the next day. The burger was lean and tasty, without shrinkage after cooking. I topped it with slices from one of the big juicy tomatoes from Steven Frank Farms, where I also bought fresh blueberries for my morning muffins. FYI: Fehr Bros. is bringing fresh-cured bacon in two weeks. I always eat well the day after the Market, and it’s never too soon to start planning breakfast. This entry was posted in 50th Ward, Devon Community Market, Farmers Markets Chicago and tagged Avon Products, Europoint Imports, Fehr Bros. Farm, Ludi Gerardi Facepainting, MarGREAT's Lemonade, Meraj Sultana Henna Designs, Milt's BBQ, Music House, Schmooz the Clown, Steven Frank Farms, Trenae Gourme by 50th Ward Follies. Bookmark the permalink. It’s all true, Music House talent is in fine form!